Uwe Rosler on the sidelines at his last match in charge of Leeds United. Leeds United are looking for yet another new manager after Uwe Rosler was sacked this morning following just 12 games in charge. Former Rotherham boss Steve Evans has already been heavily linked to take over with a quick decision needed to steer the Whites through a testing period coming up with five games in the next two-and-a-half weeks. 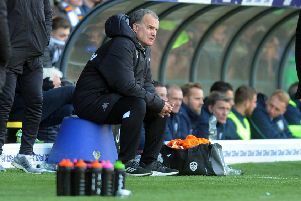 Rosler only took the job in the summer, replacing Neil Redfearn at Elland Road, but has become the fifth manager sacked by owner Massimo Cellino since he took over in 2014. Leeds have only won two games so far this season and are down in 18th place in the Championship after losing their last three games. They have yet to win at home and on Saturday set a record for the number of consecutive games without a win at Elland Road. Only two weeks ago Cellino exclaimed his happiness with the job Rosler was doing, but two defeats later he has decided to wield the axe. It is believed he is now set to turn to former Rotherham boss Evans, with some reports saying an announcement was possible later today.